Over the last 27 years, Community Supported Agriculture (CSA) has become a popular way for consumers to buy local, seasonal food directly from a farmer. Here are the basics: a farmer offers a certain number of "shares" to the public. Typically the share consists of a box of vegetables, but other farm products may be included. Interested consumers purchase a share (aka a "membership" or a "subscription") and in return receive a box of seasonal produce each week throughout the farming season. During the summer, shareholders will come once a week to pickup their boxes of vegetables and fruits from our daily farm stand. You will get a mixed box of whatever is being picked that week. The produce will change as the season changes weekly. It's a simple enough idea, but its impact has been profound. Tens of thousands of families have joined CSAs, and in some areas of the country there is more demand than there are CSA farms to fill it. This mutually supportive relationship between local farmers, growers and community members helps create an economically stable farm operation in which members are assured the highest quality produce, often at below retail prices. In return, farmers and growers are guaranteed a reliable market for a diverse selection of crops. Your support of us is support of sustainable agriculture here in the heart of suburbia, where the challenges to making a viable farm enterprise are considerable. Be green, encourage food safety and security, and become more connected to the natural world by being connected to our garden/farm – a place where excessive rainfall, drought, ladybugs, cutworms, woodchucks and monarch butterflies are closely observed – and to us, who succeed or fail based on our skill and luck at participanting in this web of life. Supporters cover a farm's yearly operating budget by purchasing a share of the season's harvest. CSA (Community Supported Agriculture) members make a commitment to support the farm throughout the season, and assume the costs, risks and bounty of growing food along with the farmer or grower. Members help pay for seeds, fertilizer, water, equipment maintenance, labor, etc. In return, the farm provides, to the best of its ability, a healthy supply of seasonal fresh produce throughout the growing season. Becoming a member creates a responsible relationship between people and the food they eat, the land on which it is grown and those who grow it. 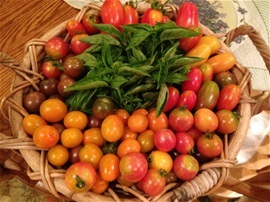 Shareholders do not know what they are getting in advance, but they know it will be nutritious seasonal local bounty. Enjoy fresh picked vegetables throughout the season and help us preserve open land in the area.